You're a foodie just like us, when your headed to a new place you email all your foodie friends asking for the best restaurant recommendations and what to order at each restaurant. We get it, we do the same thing, traveling and food go hand in hand. This blog is dedicated to all you foodies, we are going to share our most popular summer favorites. 1. When food blogger @MDoughw_Eats posts your Saturday Express Lunch, the Prosciutto & Fig Tartine, and it gets reposted by Food & Wine and goes viral it's probably pretty good! Toasted 9 grain bread, locally sourced Avalanche Goat Cheese, roasted mission figs and crispy prosciutto. Trust Food & Wine, it's as good as it looks. 2. Mawa's Green Crepe, this is a local favorite. The roaring fork valley is a healthy community, many of our patrons are vegetarian, vegan, gluten-free etc. Mawa's Green Crepe is filled with avocado, spinach, basil pesto and mozzarella. Vegetables are locally sourced from local farms, it's light and fresh and the flavors will entice you to eat green more often. This can also be served gluten-free, just say Buckwheat crepe please. 3. Rainbow Quinoa & Arugula Salad, it's summer and we all love a great salad. This one is great without meat but can also be added or it can be made vegan. The homemade apple and honey lemon vinaigrette seals the deal. Enjoy! 4. Healthy Mexican, is there such a thing? 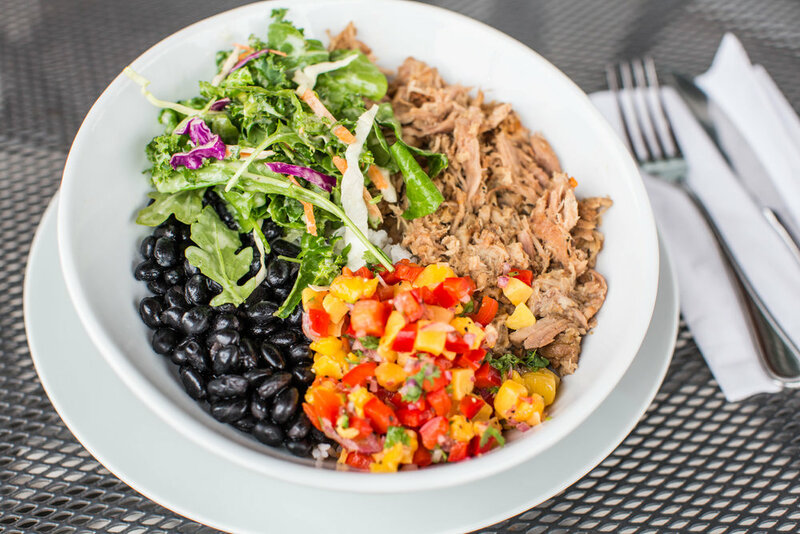 Skip the tortilla and sub out the rice for quinoa and you have a delicious, low carb Pork Carnitas Bowl. The slow roasted pork with the mango salsa is the perfect combo of sweet and salty. 5. Peaches and Cream Crepe. Not all dessert is sinful, well not to us when there is fruit involved. We think this picture describes it better than words and it's only offered for a limited time while Palisade peaches are in season so you better rush in.